Two BIG Additions Coming to Anakeesta! Vista Gardens, an enchanting botanical garden, features walking trails that meander through lush and colorful gardens, a cascading stream, a shaded pergola for resting and enjoying the views, a children’s play area, and more. Vista Gardens will open in June! Anakeesta was honored to have Atlanta blogger Leigh Anne Borders author of Living One Full Life visit us this month. Leigh Anne shared all about her day and the magic she experienced in the mountains here in Gatlinburg! Read the full article on Living One Full Life here! Residents of Cocke, Hamblen, Jefferson and Sevier Counties can visit Anakeesta for a small donation of $5.00 (for admission only) that will go directly to support Friends of the Smokies. Eligible guests may bring a spouse and dependent children OR one guest. ID holder must be 16 or older, possess a valid ID or a recent paycheck stub from a business in the selected counties with valid ID to match. Who’s Ready to Zip Longer? We are adding a third zipline to our already exhilarating Dueling Zipline Adventure! By extending the course you will now be able to zip over the Chondola and take in amazing aerial views of the National Park and Downtown Gatlinburg. The third zipline will be ready to ride in time for Spring Break fun! Anakeesta Winter Hours Anakeesta is expanding! We are working on some exciting projects slated to open this spring that will make your Anakeesta experience even more spectacular. Hours for January 8th – February 28th: Friday, Saturday, Sunday: 10:00 AM – 7:00 PM Monday -Thursday: CLOSED **We will be open on Martin Luther King Day, Monday, January 15th and Presidents Day, Monday, February 19th. Gatlinburg has a new destination getaway that combines amazing views of the Great Smoky Mountains, genuine hospitality, and exciting attractions. Named after the Cherokee word meaning, “Place of the Balsams” [high grounds], Anakeesta delivers breath-taking experience from the mountaintop. In a town with so many great sights and attractions, it could be easy for a new attraction to get lost in the mix. However, Anakeesta is not a typical attraction. Blending a variety of memorable attractions and delicious food with stunning views atop the mountain, it is no wonder this new destination is an instant hit with locals and families visiting the area. Business owners are proceeding with new Great Smoky Mountains projects after deadly wildfires last November. —– Bob Bentz had just installed underground utility lines and paved a new road when wildfires roared through the eastern Tennessee treetop canopy he wanted to transform into a $30 million adventure park. A year later, after the blaze killed 14 people and damaged or destroyed about 2,500 buildings in the Gatlinburg area, tourists now take a ski lift from downtown up 600 feet to the Anakeesta resort, where they can zip-line, shop, explore a treehouse playground and wander tree to tree on a sky-bridge. The otherwise whimsical park saved space at its highest point for a memorial walk, featuring photos and stories about the heroism, heartbreak and raw destructive force of the fires. The Great Smoky Mountains have attracted outdoorsy folks with something to prove for decades, and now there’s one more reason to make the trip. Anakeesta, Gatlinburg’s newest attraction, is a mountain adventure park that opened in September. 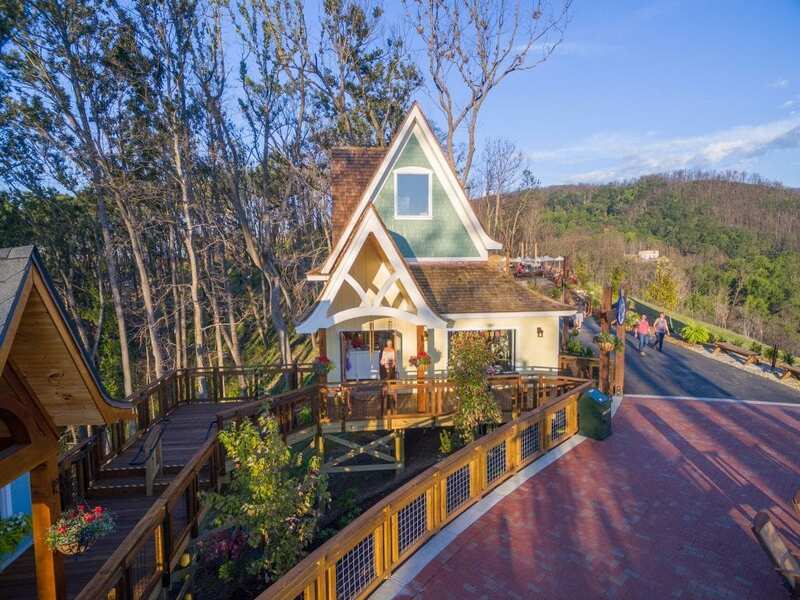 Hop on a chondola (chair-gondola) for an exhilarating 15-minute ride to Firefly Village, a treehouse-themed village at the mountain summit. From there, your adventure begins. Dare a friend to soar through the trees on dueling racing zip lines, or stroll along the vertigo-inducing treetop canopy walk that has 16 bridges suspended 40 feet in the air. A high-speed mountain coaster is coming soon. 576 Parkway, Gatlinburg. 865-325-2400, anakeesta.com, @AnakeestaTN. It’s The Most Wonderful Time of the Year! The city of Gatlinburg kicked off their annual “Winter Magic” on November 8th. The entire city has been transformed into a magical winter wonderland and Anakeesta is part of the fun! We will celebrate our first Christmas with sparkling lights and decorations, hot chocolate, apple cider, carolers, Tunes & Tales and more! Santa will be sitting for a professional photo with kids of all ages that can be purchased by families. Santa’s elves will give away a peppermint stick to each child. DATES: November 24 & 25 December 2, 8, 9, 15, 16 TIME: 6:30 PM – 9 PM Christmas events are scheduled on the Parkway Plaza as well as on the mountain so be sure to follow Anakeesta on Facebook as we announce dates for our different events and activities. Click here for more information on Winterfest 2017! Gatlinburg Fantasy of Lights Parade Mark your calendar for Friday, December 1st and come enjoy Gatlinburg’s 42nd annual Fantasy of Lights Parade throughout downtown Gatlinburg. Be on the lookout for the Anakeesta elves in the parade festivities that will include lighted floats, marching bands, equestrian units, giant balloons and of course Santa Clause! What’s been happening at Anakeesta you ask? Stay updated on our social media for special event updates and hours! The temperature is dropping, the leaves are changing, and Anakeesta is ready to celebrate one of the most beautiful seasons in the Smokies! A Spooky Celebration Bear sightings are pretty common in the mountains, but what about alien, witch and superhero sightings? That’s what you’ll see if you come celebrate Halloween at Anakeesta! We’ll be dressing up and offering trick-or-treating for our little goblin guests, tasty fall treats and even some night time ziplining!